I served as the Executive Secretary of International Economics and Finance Society (IEFS) between 2013-2015. 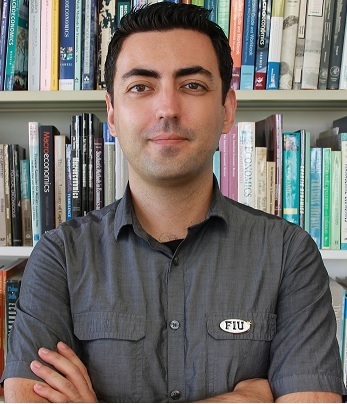 I organized Midwest Macroeconomics Meeting at Florida International University in Fall 2014. "Gasoline Prices, Transport Costs, and the U.S. Business Cycles" has been published at Journal of Economic Dynamics and Control. "Agglomeration and Trade: State-Level Evidence from U.S. Industries" has been published at Journal of Regional Science. "Relative Price Variability and Inflation: Evidence from Micro Price Data" (with Deniz Baglan and Ege Yazgan) has been published at Journal of Macroeconomics. "Trade Partner Diversification and Growth: How Trade Links Matter" (with Ali Sina Onder) has been published at Journal of Macroeconomics. "Trade and Cities" (with Cem Karayalcin) has been published at World Bank Economic Review. “International Cities as the Economic Unit of Account: Theory and Measurement,” (with Mario J. Crucini and Mototsugu Shintani). Awarded by the National Science Foundation (Award # 1030164). September 2010 – August 2015. The total award was $513,111. "Understanding the International Elasticity Puzzle" Journal of Macroeconomics, 2019, 59: 140-153. "Daily Exchange Rate Pass-Through into Micro Prices" (with Renzo Alvarez, Amin Shoja and Syed Uddin) Applied Economics Letters, 2019, 26(6): 440-445. "Spatial Dispersion of Retail Margins: Evidence from Turkish Agricultural Prices" Agricultural Economics, 2018, 49(4): 455-462. "Anti-Crime Laws and Retail Prices" Review of Law and Economics, 2017, 13(3): 1-18. "Geographical Dispersion of Consumer Search Behavior" Applied Economics, 2017, 49(57): 5740–5752. "Asymmetric Incidence of Sales Taxes: A Short-Run Investigation of Gasoline Prices" Journal of Economics and Business, 2017, 91: 16-23. "The Role of Direct Flights in Trade Costs" (with Demet Yilmazkuday) Review of World Economics, 2017, 153(2): 249-270. "Relative Price Variability and Inflation: Evidence from Micro Price Data" (with Deniz Baglan and Ege Yazgan) Journal of Macroeconomics, 2016, 48: 263:282. "Understanding Gasoline Price Dispersion" (with Demet Yilmazkuday) The Annals of Regional Science, 2016, 57(1): 223-252. "Constant versus Variable Markups: Implications for the Law of One Price" International Review of Economics and Finance, 2016, 44: 154-168. "High versus Low Inflation: Implications on Price-Level Convergence" (with Ege Yazgan) Empirical Economics, 2016, 50: 1527-1563. "Gasoline Prices, Transport Costs, and the U.S. Business Cycles" Journal of Economic Dynamics and Control, 2014, 45: 165–179. "Understanding Long-run Price Dispersion" (with Mario J. Crucini), Journal of Monetary Economics, 2014, 66: 226-240. "Price Dispersion across U.S. Districts of Entry" Economics Letters, 2014, 123(3): 361-365. "Inflation Targeting, Flexible Exchange Rates and Inflation Convergence" Applied Economics, 2013, 45(3): 593-603. "Business Cycles through International Shocks: A Structural Investigation" Economics Letters, 2012, 115: 329-333. "How Wide is the Border across U.S. States?" Letters in Spatial and Resource Sciences, 2012, 5(1): 25-31. "Price-Level Convergence: New Evidence from U.S. Cities" (with Ege Yazgan), Economics Letters, 2011, 110: 76-78. "Okun's Convergence within the U.S." (with Ege Yazgan), Letters in Spatial and Resource Sciences, 2009, 2(2-3): 109-122. "Financial Health and The Intensive Margin of Trade" (with Deniz Baglan) Emerging Markets Finance and Trade, 2018, 54(6): 1304-1319. "A Solution to the Missing Globalization Puzzle by Non-CES Preferences" Review of International Economics, 2017, 25(3): 649-676. "Individual Tax Rates and Regional Tax Revenues: A Cross-State Analysis" Regional Studies, 2017, 51(5): 701-711. "Forecasting the Great Trade Collapse" International Economics, 2016, 147: 145-154. "Pass-through of Trade Costs to U.S. Import Prices" Review of World Economics, 2015, 151(4): 609-633. "Importer-Specific Elasticities of Demand: Evidence from U.S. Exports" International Review of Economics and Finance, 2015, 35: 228-234. "Mismeasurement of Distance Effects: The Role of Internal Location of Production" Review of International Economics, 2014, 22(5): 992–1015. "Bilateral versus Multilateral Free Trade Agreements: A Welfare Analysis" (with Demet Yilmazkuday), Review of International Economics, 2014, 22(3): 513–535. "Understanding Interstate Trade Patterns" Journal of International Economics, 2012, 86: 158-166. "Agglomeration and Trade: State-Level Evidence from U.S. Industries" Journal of Regional Science, 2011, 51(1): 139-166. "Trade Partner Diversification and Growth: How Trade Links Matter" (with Ali Sina Onder) Journal of Macroeconomics, 2016, 50: 241–258. "Trade and Cities" (with Cem Karayalcin) World Bank Economic Review, 2015, 29 (3): 523-549. "Inflation Thresholds and Growth" International Economic Journal, 2013, 27(1): 1-10. "Thresholds in the Finance-Growth Nexus: A Cross-Country Analysis" World Bank Economic Review, 2011, 25(2): 278-295. "The Effects of Currency Crises on the Long-Run Growth" Applied Economics Letters, 2010, 17(3): 209-212. "Inflation, Finance and Growth: A Trilateral Analysis" (with Peter L. Rousseau), Economic Systems, 2009, 33(4): 310-324. "Can Inflation Targeting Regimes be Effective in Developing Countries? The Turkish Experience" (with Ali Kutan and Cem Akyurek), Journal of Asian Economics, 2011, 22(5): 343-355. “Monetary Policy and Credit Cards: Evidence from a Small-Open Economy” Economic Modelling, 2011, 28: 201-210. "The IS Puzzle and Relative Risk Aversion in Turkey" (with Ege Yazgan), Empirical Economics Letters, 2010, 9(2), 131-138. "The Effects of Credit and Debit Cards on the Currency Demand" (with Ege Yazgan), Applied Economics, 2009, 41(17): 2115-2123. "The Effects of Currency Crises On the Business Cycles: An Alternative Regime-Shifting Approach" Emerging Markets Finance and Trade, 2009, 45(1): 31-48. "Productivity Cycles in Public and Private Manufacturing Sectors: Evidence from Turkey" International Journal of Applied Economics, 2009, 6(2): 21-40. "An Analysis of Regime Shifts in the Turkish Economy" (with Koray Akay), Economic Modelling, 2008, 25(5): 885-898. "Twin Crises in Turkey: A Comparison of Currency Crisis Models" European Journal of Comparative Economics, 2008, 5(1): 107-124. "Structural Breaks in Monetary Policy Rules: Evidence from Transition Countries" Emerging Markets Finance and Trade, 2008, 44(6): 87-97. "Money Shocks and Output: A Contemporary Money Demand Approach" Empirical Economics Letters, 2008, 7(1): 1-4. "Inflation Targeting Supported by Managed Exchange Rate" Applied Economics, September 2007, 39(16): 2011-2026. "Monetary Policy Rules in Practice: Evidence from Turkey and Israel" (with Ege Yazgan), Applied Financial Economics, January 2007, 17(1): 1-8. "Inflation Dynamics of Turkey: A Structural Estimation" (with Ege Yazgan), Studies in Nonlinear Dynamics and Econometrics, 2005, 9(1): 1:13. “Sources of Inflation: Global and Domestic Drivers” (with Jongrim Ha, Ayhan Kose and Franziska Ohnsorge), in Jongrim Ha, Ayhan Kose and Franziska Ohnsorge ed. Inflation in Emerging and Developing Economies, 2018, DC: World Bank Publications. “Inflation and Exchange Rate Pass-Through” (with Jongrim Ha and Marc Stocker), in Jongrim Ha, Ayhan Kose and Franziska Ohnsorge ed. Inflation in Emerging and Developing Economies, 2018, DC: World Bank Publications. "What is the Optimal Rate of Inflation for Long-Run Growth? A Cross-Country Analysis" in Richard L. Bertrand ed. Theories and Effects of Economic Growth, 2011, NY: Nova Science Publishers, Inc.
"Why are Trade Agreements Mostly Regional? A Welfare Analysis by Transportation Costs" (with Demet Ulker), in Paul E. Weston and Robert N. Townsend ed. Welfare Economics, 2009, NY: Nova Science Publishers, Inc.
Read my NBER working papers.